It may have been a couple of weeks since the winners were revealed, but here at FSE, we’re still buzzing from the excitement of the Mid Essex Business Awards. 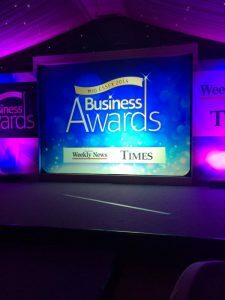 When organisers approached us with the opportunity to sponsor the 2014 Business Awards, we jumped at the chance to celebrate the success of some of the finest businesses in Mid Essex. The awards took place at the Fennes in Bocking, Essex, on 26th September 2014. With elegant starlit ceilings and stunning chandeliers, the Georgian Manor House was the ideal venue for such an event, and its 100 acres of beautiful countryside provided the perfect backdrop to one of the county’s most prestigious awards nights. The glamorous ceremony, which was hosted by the Chelmsford Weekly News and Newsquest Essex, began with a champagne reception followed by a beautiful three course meal. There were inspiring speeches from influential figures in the Essex business community before sponsors took to the stage to announce their winners. Danny and Danielle, FSE’s co-directors, presented the Business to Business Category. After visiting and interviewing representatives for many businesses around Essex as part of the judging process over a number of weeks, and after much deliberation, they finally assigned first prize to local PR agency Sarah Bee Marketing. CJ Bardwell, an established building, civil engineering and groundworks company near Chelmsford, were noted as the category’s Highly Commended Company of Choice. Congratulations to both companies and also to the Newsquest team for putting on such a fantastic evening. We can’t wait to see what next year has in store! For photos of the evening, an introduction to our winners and more information about the awards scheme itself, check out our Twitter page using @freelanceseosx. Give us a follow if you want to stay up to date with what our team are up to!